Update: Ground controllers at NASA’s Ames Research Center have confirmed that the LADEE spacecraft impacted the surface of the moon, as planned, between 10:30 and 11:22 p.m. MDT on Thursday, April 17. Click here for the full story. At the conclusion of a highly successful 130-day mission, the NASA Lunar Atmosphere and Dust Environment Explorer (LADEE) is planned to impact the surface of the moon on April 21, 2014. 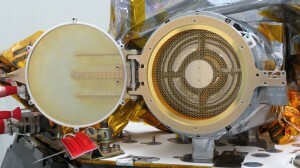 LADEE carries the Lunar Dust Experiment (LDEX), which is the latest in a series of dust detectors designed and built at LASP. LADEE launched in early September 2013 and, after two months of orbital maneuvers and instrument commissioning, began investigating the tenuous atmosphere of the moon in order to characterize its density, composition, and variability. The LDEX instrument has recorded more than 11,000 impacts from lunar dust particles in an effort to determine the size, charge, and spatial distribution of dust grains lofted above the moon’s surface. The LADEE mission completed its primary 100-day science objective in March, but NASA approved a 28-day mission extension, allowing the spacecraft to gather an additional full lunar cycle worth of data from very low altitudes. The additional data, collected from within a few miles above the lunar surface, has given mission scientists an opportunity to observe changes in particle density and size distribution at a wider variety of altitudes. The anticipated April 21 impact will take place on the far side of the moon, opposite our view from Earth, and far from any of the historic Apollo exploration locations. Horányi is also the principal investigator for the LASP-built Student Dust Counter (SDC) aboard NASA’s New Horizons mission. New Horizons is scheduled to fly-by Pluto in July 2015 and then proceed on to undetermined objects in the Kuiper Belt, a massive region beyond the dwarf planet, which contains icy objects left over from the formation of the solar system. The SDC is the first student-built instrument ever to fly on a NASA planetary mission. In addition to the dust detectors onboard New Horizons and LADEE, LASP provided the Cosmic Dust Experiment (CDE) for the NASA Aeronomy of Ice in the Mesosphere mission. CDE is an in-situ dust detector designed to measures the influx of dust particles into the Earth’s upper atmosphere in order to address their role in the formation of noctilucent clouds.